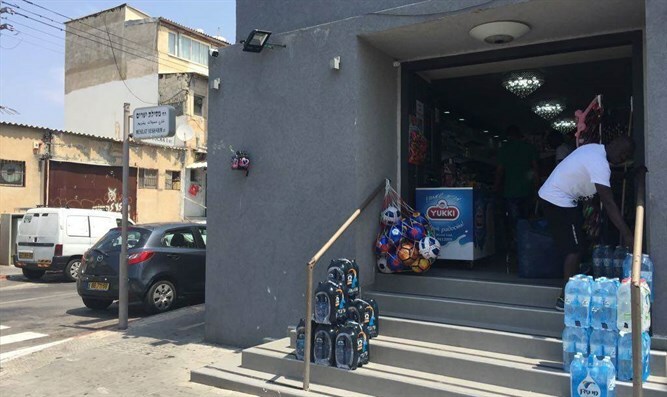 Tel Aviv synagogue closes, building now serves as supermarket for city's infiltrators. What happened to the "Keter David" synagogue? At the corner of Mesilat Yesharim and Bar Yochai Streets, in Tel Aviv's southern Shapira neighborhood, stood the Keter David synagogue. Two months ago, the synagogue closed. Southern Tel Aviv's character has completely changed in the past few years, since the number of infiltrators from Africa grew exponentially, until a fence was built along the border with Sinai. Most of these infiltrators arrive for economic reasons. It is symbolic, therefore, that the synagogue no longer serves its original purpose. Its sign has been painted over with white paint, and the building itself now serves as a supermarket for the burgeoning infiltrator population. The Supreme Court ruled Monday afternoon that the arrangement for the voluntary removal of illegal infiltrators to a third country is a legal arrangement and can continue. However, the judges ruled that since the deportations are voluntary, infiltrators who refuse to be deported to a third country cannot be imprisoned for their refusal. The Supreme Court has provided for the vast majority of infiltrators to obtain visas allowing them to stay. Israel is dealing with over 39,000 African infiltrators, not counting children. The children of the African illegal immigrants flood south Tel Aviv's kindergartens, where they are provided with state-of-the-art preschools, while the crime rates in those areas have skyrocketed and people are afraid to walk the streets in working class neighborhoods that were once safe. "In the years of rage in Europe, many synagogues were destroyed, desecrated and burned. Others became churches or various public buildings. In recent years, many of the synagogues have returned to Jewish hands thanks to the actions of Chabad emissaries, the Jewish Agency, diplomats and good Jews who care. Some of the synagogues have become museums and others have again become places of worship as they originally were. "This is the tendency around the world and among European governments - to return the synagogues to their original use. Not only this, but they sometimes invest money to preserve and take care of the holy sites. "There, the holy sites have turned into supermarkets for infiltrators..."
All photos by Sheffi Paz.